I’m going to dedicate this review to all the fans of Bionic Commando, without whom I probably would not have gotten past the game’s harsh first impression. Apparently a lot of people are very rabid about this title, which I discovered when trying to find an instruction manual to make sense of the thing. Fansites, essays, testimonials as to how this game got people interested in game design; the list goes on, much to my shock at the time, as I’d never even heard of the game when it was first released. So, I would not say that the fans won me over – but they convinced me to take a second, grateful look at a game that takes an extreme amount of adjusting to. The game is a possible, or at least spiritual, sequel to Capcom’s original Commando game. In this exciting episode, a coalition of generally bad fellas – Nazis in the Japanese version, the “Badds” in the American – are using World War II plans for a massive weapon to threaten your benevolent federation. The hero from Commando, Super Joe, is sent in to their territory and captured. The hero for this game, the titular Bionic Commando, is tasked with rescuing Joe and putting a stop the evil plans a’brewin. This makes sense after all. If your regular ol’ Commando gets captured, then it is indeed time to step it up with your Bionic Commando. Let’s get one thing out of the way from the start, as it’s the first thing you’re going to notice when you boot this game up. Bionic Commando is a platform game where you cannot jump. That’s right. Platform game, no jumping. 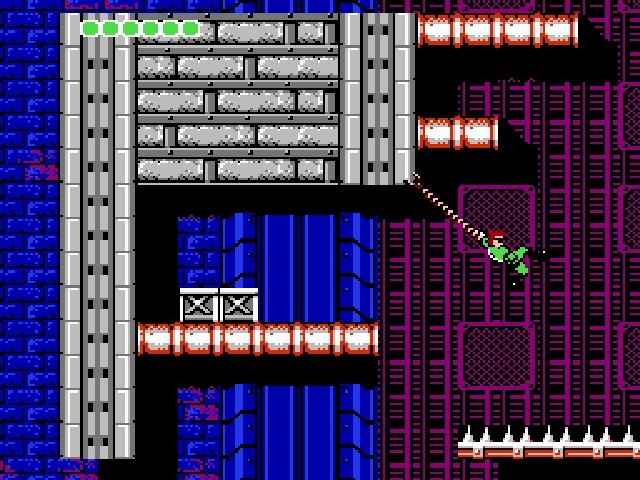 You instead traverse the levels through use of an extendable Inspector Gadget claw arm that hoists you up to new ledges, or swings you across gaps a la Pitfall. Just reading this makes the idea sound like an interesting and clever twist on a well-defined formula. Actually putting it into play comes off a little more rough. Waist-high boxes now block your path, and ledges right next to you, in clear jumping distance, can only be reached through a combination of zipping up to higher ledges and swinging around to the correct ledge. You cannot shoot up or down, only in a straight line on the platform you’re currently on. In order to hit enemies on other ledges, you either have to grapple a ledge near them to shoot from, or time your moves to climb up or drop down behind them. However, enemies use standard platformer AI, so when they “know” you’re up on a ledge above them, they’ll just follow you around as you run back and forth, trying to lure them away from the edge so you can jump down for a clean kill. You can climb up through ledges by hooking onto them, but you cannot drop down through platforms you’re already on – you have to go to either edge and drop down like a stone. This all results in a game that’s counter-intuitive to the extreme, and damned frustrating, since you cannot do simple tasks you’re used to being able to do in this genre. You will literally have to re-learn how to play platform games before you can get very far in this one. Some of you may view that statement as anti-intellectual, or a suggestion that the game is no good, when you really just have to approach it with an open mind. That’s not the intent, and not entirely true either. Frustration or poor performance at this game is not a result of being unable to shed the shackles imposed upon you by notions cemented by previous games, and you are not stubborn or stupid because you can’t get behind the controls. If anything, the game shows you how important jumping is in these kinds of games, because only in the absence of having it, do you truly appreciate how frequently you rely on it. It’s also worth pointing out that you could count on one hand the number of true platform games, like this one, that don’t allow you to jump. But this is not a dissertation on the indispensability of jumping in videogames. It is however, going to be the major point of consternation for any newcomers, and you’ll need to be prepared for it. Luckily, the game does its best to ease you into the controls and the challenge. The entire game is non-linear to a point, in that levels are broken up by a helicopter map where you instruct your crew where to go. Levels are defined by linked numbered areas, which are in no particular order. The numbers serve only as designators – i.e. the Arsenal is Area 4. Taking a page from Metal Gear, radio sets are placed in every level allowing you to communicate with your home base and eavesdrop on enemy chatter. These are the primary source of hints for where to go next, and for intel on matching practical locations with arbitrary area numbers. They are also the primary source for humorous bad English translations. You cannot get to some areas until you gain items from other zones, but for the most part, you can jump ahead and around as you desire. The exception to this is the very first level you start out in, which acts as an unofficial training area. Enemies are few, you have a couple of ledges you can play around on safely to get the feel of your grappling arm, and there are a couple of forced areas designed to have you prove that you have the basics of the arm down before you can continue. It works out pretty well, and helps to set up the biggest trick you’ll need to get through the game – PATIENCE. If you’re not thinking of taking the opportunity to get some swing training in on your own time, you are going to have a problem with getting in the mindset for this game. Controlling the bionic wonder will not be too much of a chore, though subtleties in the controls can mean the difference between life and untimely demise. It’s little things, like holding down a direction for too long on a swing, which auto-detaches your arm, or forgetting to stand still when you’re in a hurry and shooting your arm out in front of you instead of at an angle. In most scenarios, you can stop or swing safely without being accosted by enemies, allowing you to plan your next move. There are, however, a couple scenarios later in the game that require precision swinging and mastery of abnormal arm combinations, with failure equaling death. These unforgiving sections require you to use what breathers you can take to nail down your timing. You will also get more chances as you progress, as you will not only earn the expected weapon and armor upgrades, but also new life bars as you collect certain amounts items from defeated enemies. You’ll start by dying in one hit, but by the end of the game (or through dedicated farming), you’ll be able to take as much punishment as you can dish out. 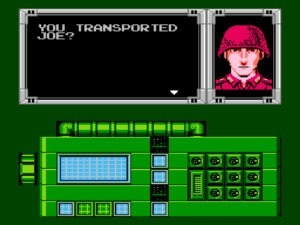 It should be noted that Bionic Commando features no passwords or game saves. You will have to beat the entire game in one session. You’ll have to be prepared to lose a couple times, spending some games just getting your timing down and learning where to go. You also will have to steer toward the trucks on the map a time or two – if you and the trucks meet on the same area space, it results in a neat little enemy engagement minigame that is the only place where you can earn continues, and many continues at that. Otherwise, complete failure results in having to restart the game from the very beginning, which can be a very painful proposition. The game will only take about 5 hours to drive through once you have some skill with the controls and know what to do – a Saturday afternoon at most – but the hair-pulling failures that will pile up before you get to that point, as well as the precision jumps that will remain tricky no matter how prepared you are for them, might limit the number of people who get to sweet victory. Which is a shame, because victory is head-poppingly sweet. The game features some pretty sharp graphics for the time. Areas do look distinct from each other, and there’s a lot of variety between them, from landing on the coast to scaling a giant fortress tower. There are nice background themes for these areas as well, but they get reused too often. The radio communications and dialogue put well-drawn faces to the words, allowing for very recognizable, reoccurring characters. About the only real graphical and gameplay glitch, really not a glitch but an annoyance, is the ability for troopers to parachute through rock ceilings. Paratroopers show up rarely, and I assume it’s to create an action sequence or get you moving when they do, but it’s awfully unfair to be trying to move while having paratroopers drop all around you, or hit you for damage as they pass right through a ledge you’re swinging on. Another issue worth mentioning is that, before you drop into an area, you’ll pick your weapon and item loadouts. You’ll get more of both as you pass areas, but you can only carry one weapon and one item from each secondary category into battle. If you pick the wrong item, you can’t abort that level and return to your inventory. Most of the time there’s no “wrong” choice, just less efficient ones, but I did notice a few areas you could get stuck on. One area in particular has a wall at the very beginning, and if you don’t bring one of the weapons to destroy it, you won’t be able to proceed, and you won’t be able to go back. It would seem in such a situation that you would have to unfairly restart your entire game. 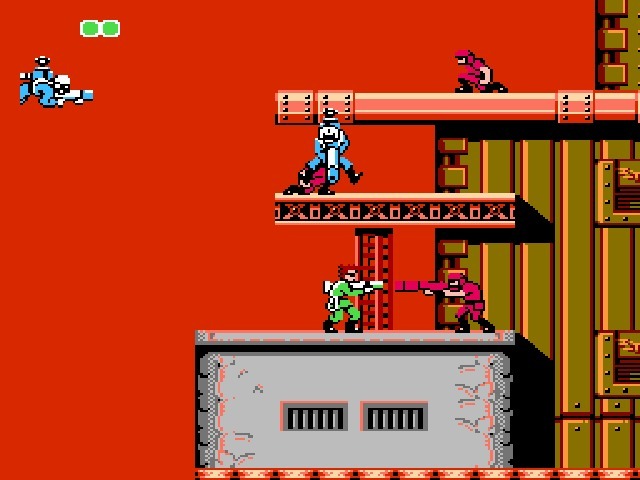 Bionic Commando is not for the faint of heart, nor should you take any particular pride in enjoying it, or shame in being too frustrated to have any fun. It is, simply, a great game for those willing and able to invest the time into it. Because it is not instantly accessible, I hesitate to call it one of the best NES games ever made – mostly because I believe that fun and frustration (serious, controller-throwing frustration) cannot coexist. So, if you can put in the time to master its unique grappling system, you’ll be rewarded. If you don’t dig it, you won’t be missing a not-to-be-missed experience. Not a bad attempt at originality, claw arm can be fun, plot is certainly worth it. No saves or continues, claw arm will also take a lot of adjustment. It actually is possible to exit sidescroller stages early in case you made a mistake: hold A+B and press Start.